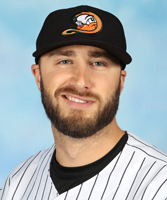 Adleman begins his first season with the Ducks and ninth in professional baseball. The right-hander reached the Major Leagues in 2016 and 2017 with the Cincinnati Reds. He combined to make 43 appearances (33 starts), going 9-15 with a 4.97 ERA and 155 strikeouts over 192 innings pitched. The Staten Island, N.Y. native made his MLB debut on May 1, 2016 at Pittsburgh, firing six innings of two-run ball while striking out six in the Reds 6-5 win over the Pirates. He proceeded to allow three earned runs or less in 11 of his 13 starts during the 2016 season and made five quality starts overall that year. Adleman also pitched during spring training with the Reds earlier this year.